Choosing a new air conditioner…. Thermostat settings: Auto or On? What Do You Do When a Plumbing Emergency Strikes? When a plumbing emergency strikes, everyone–from a novice to the most experienced do-it-yourselfer–should call a professional (for best results, call Bayonet! )…but what do you do while you’re waiting for the doorbell to ring? 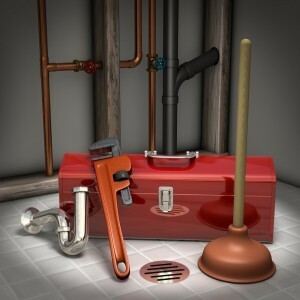 There are steps you should take to minimize the damage that can occur before the plumber arrives. There are tools that every home needs. None are expensive, but they can save a lot of money in repairs. A pipe wrench. This is a long-handled adjustable wrench designed specifically to loosen and tighten plumbing. It has teeth to grip round pipe, but they leave marks, so if you use a pipe wrench on anything visible, wrap duct tape around the teeth to minimize the damage..
Ball or flange plunger. This plunger is designed to seal the hole at the bottom of a toilet and use suction to clear the clog. Do not confuse a ball plunger with a cup plunger, which is for sinks or tubs. Cup plunger. This plunger is for use in sinks, tubs, and showers. It doesn’t do a good job on a toilet, so leave toilets to flange plungers. Shut off the water immediately. Locate your water shutoff valves for every sink, shower, tub, toilet, and appliance. When a pipe bursts or water overflows, you can stop it at the source. At a minimum find the main shutoff valve for the house, but this isn’t ideal. Never go into an area if there is electricity near the flood. Shut down the electricity to the entire area immediately. Let the plumber know that electricity may be involved. For a leaking water heater, turn off the power source – via a shutoff valve if it’s gas or an emergency switch if it’s electric. Be sure to turn off the water as well. Don’t use chemicals on a clog; they aren’t as effective as a good plunger or auger and can be dangerous if they get on skin, fabric, or bathroom surfaces. Remember, any serious clog or leak should be looked at by a plumber; just because you’ve used your tools to temporarily fix your problem doesn’t mean you don’t have a bigger one.